I have a few mental lists rattling around in my brain and I often think I need to write them down somewhere. Since most of them have to do with food, the most logical place to do so would be here. I have the Tools I Can’t Live Without list. I have the Desert Island Cookbooks list. I have the Top 10 Hated Tasks in the Kitchen list. And I also have the Things I Need to Learn How to Make or Do list. On that last list, you would find sourdough starter, croissants, puff pastry, fondant covered cakes, homemade ice cream – but at the very top of the list, you would find homemade pasta. I know pasta isn’t hard to make (neither is ice cream for that matter), it’s just something I haven’t committed to yet. I don’t have the right equipment and I just haven’t wrapped my brain around trying it. Maybe I fear that once I try it, I will never be happy with dried again. Maybe I’m just a little lazy in the pasta department. 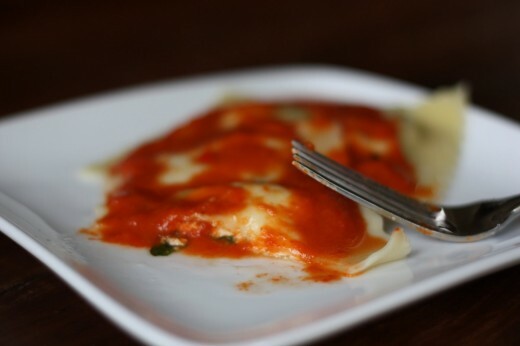 Before we left for Kauai, I got it in my head that I wanted to make ravioli for my clients. I love ravioli but I hate ordering them in restaurants. In my experience, you pay $18 for four two-bite pillows that inevitably contain butternut squash, ricotta and sage, and are swimming in a brown butter sauce. Yes, that kind of ravioli tasted good the first time I had them and now I am over it. So, when I found this recipe that sounded like it just might be the perfect flavor combination, I had to try it. 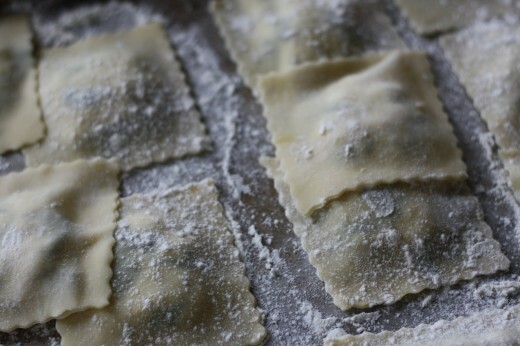 I know that, in a pinch, you can use won ton wrappers as a stand-in for fresh pasta and so I decided to give it a whirl. I have to say, I was really happy with how this turned out – and believe me when I say that I am my own worst critic. I could of course tell how this dish would be transcendent with fresh pasta, but the wrappers worked really well and were an incredible time saver. They are more toothsome than pasta but so easy to work with. The filling had just the right amount of crunch, creaminess, and savory flavor and the sauce was the perfect accompaniment. I am kind of hot and cold on roasted red peppers and wasn’t sure how I would feel about a sauce that starred them. 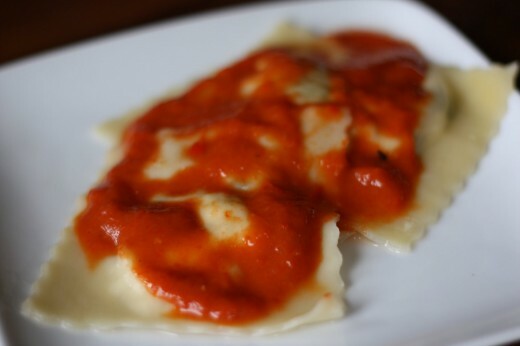 But it was subtle enough to let the flavors of the ravioli shine through, but assertive enough not to just be red sauce. You will not use all the won ton wrappers, but the leftovers can be wrapped and frozen for next time. You can, of course, use jarred peppers here. If you are going to roast your own, do three large ones and if you have left over, just add them to your next salad. They keep well in the refrigerator for days. 1. Lightly flour a baking sheet and set aside. 2. Combine the cheeses and hazelnuts in a medium mixing bowl. 3. On a cutting board, lay the basil leaves in a stack with the stem ends toward you. Roll the leaves cigar-style and thinly slice them into ribbons. Add to the cheese mixture. 4. Have the won ton wrappers, the cheese filling, the egg wash, a pastry brush, and a pastry cutter (or small sharp knife) ready in front of you. Take one wrapper at a time (be sure you have one because they stick together) and place it front of you. Spoon approximately a tablespoon of filling into the center of the wrapper and flatten it slightly. Brush the egg wash over all the exposed surface of the wrapper, and top with another wrapper. Push out any air bubbles. 5. Using the pastry cutter or the sharp knife cut off the edges so that you either have squares or rough circles. Be sure to not cut into the filling at all, just excess wrapper. Place ravioli on the baking sheet as you work and sprinkle lightly with flour. 7. Bring a large pot of salted water to a gentle boil. Gently drop the ravioli into the water, allowing 6 ravioli per person. (You may have to cook the ravioli in batches to avoid overcrowding.) Cook until the ravioli float to the surface and the pasta is tender, about 3 minutes. Using a slotted spoon, remove the ravioli and divide among plates. Top with the warm sauce and serve. The sauce with a little lemon and balsamic sounds great! I love to make fresh pasta and especially ravioli. I’ll try this recipe next. I make a corn, goat cheese and basil one I’ll have to give you the recipe for. It is super too. I’m a fan of the wonton wrappers. Anything to speed up dinner! whoa this recipe looks delicious! I haven’t worked with pasta either- but I’m committed to giving it a try sometime soon!! In the meantime, it’s good to know that wonton wrappers will work well with this dish too! These look fabulous! Thank you. And, btw, if you start that sourdough starter, please share some with a local foodie!